1Cornell C. (2011). “The real cost of raising a child.” Money Sense Magazine. http://www.moneysense.ca/2011/08/10/the-real-cost-of-raising-kids/ -accessed on June 29, 2012. 1Cornell C. (2011). “The real cost of raising a child.” Money Sense Magazine. 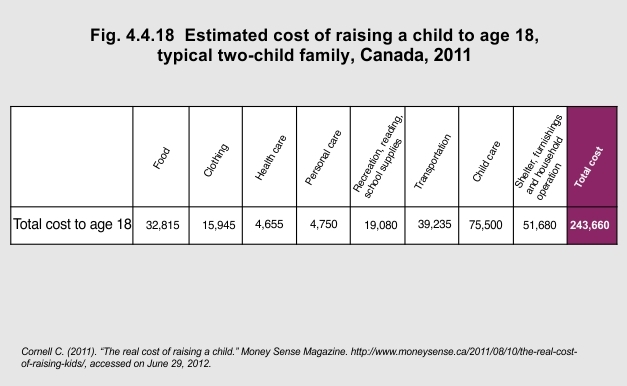 http://www.moneysense.ca/2011/08/10/the-real-cost-of-raising-kids/ – accessed on June 29, 2012. 2Phipps S, Lethbridge L. (2006). “Income and the Outcomes of Children.” Statistics Canada. http://publications.gc.ca/collections/Collection/Statcan/11F0019MIE/11F0019MIE2006281.pdf – accessed on June 29, 2012.